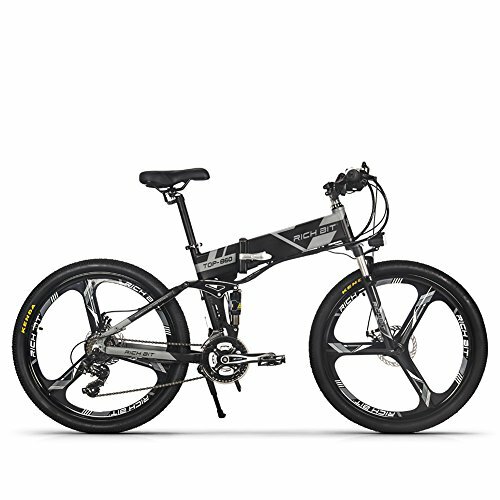 RT860, Classical Mountain Bike Shape, Powerful Electric battery, it's a beautiful combination of Classic and Fashion Cycling Model. 21 Speed, High performance, Function Dual Suspension. Wonderful Cycling Experience! Three Cycling models, Computer control and Torque sensor, ELECTRIC TWIST THROTTLE---PEDAL ASSIST/PAS---ONLY PEDAL. Perfect Frame Concealed, battery inside, waterproof function, a standard work of design and practice. * the battery is packed with the bike parcel, it's arrived quickly and directly to your address. Mini Folding Size, easy working at your commute way at city street and weekend off road and varies environments. easy stock at a small space, your car, truck, subway. you can use the throttle model in your private roads separately, and in public road, you just take the keys off and only use the Pedal Assisted Model to follow the local rules. Speed: 7 levels of PAS, 18-22mph/ Throttle Model Range: Throttle Model// 40-50KM PAS//45-60KM battery concealed with bike frame, perfect integrated, easy to charge and release. easy to cycling. Battery Packed with Bike Package, When the bike deliveryed, it will be partialy assembled for for shipping protection, you will need assemble the front wheel,the seat, the pedals and the headlebar, all the electric parts are connected. before your first cycle, please be sure the brake and gear. we have responsible post selling service, if you have any question about the assemble, please contact us.